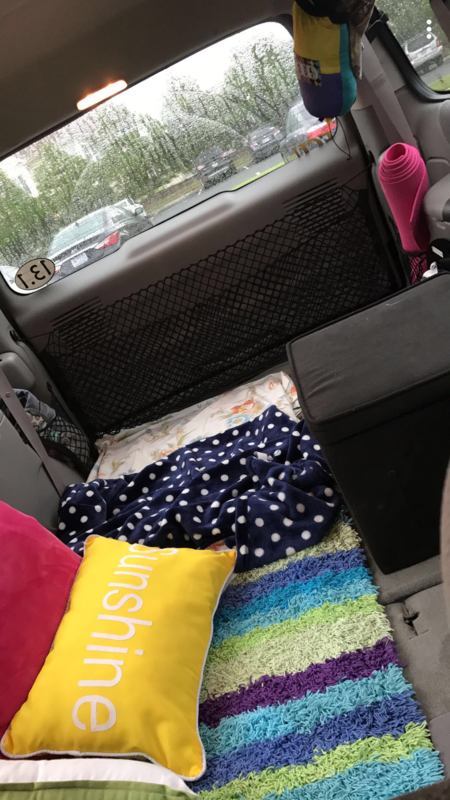 This is what my bedroom looked like when my van became my home! 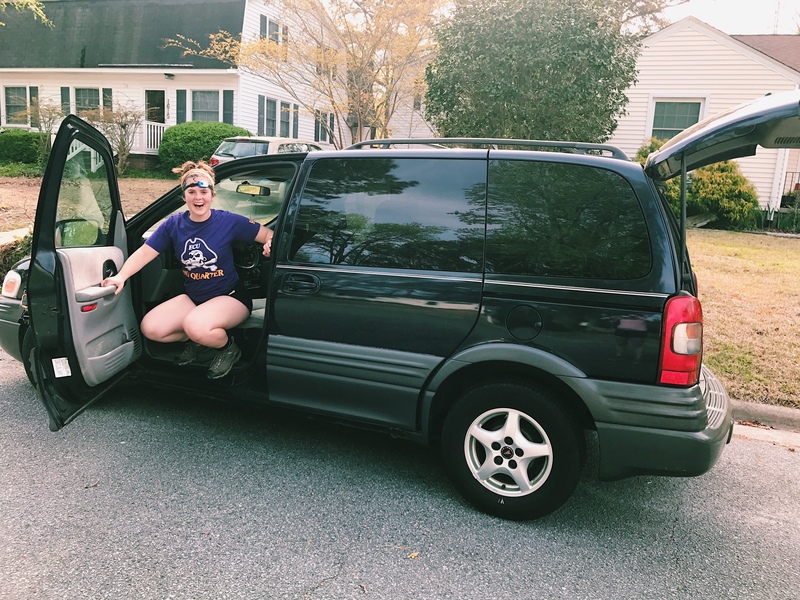 I have been following ‘van life’ for about a year. The countless hours I have spent on YouTube and Pinterest researching how people actually live out of a vehicle. The whole concept is really neat to me. I decided I wanted to try it out. Last summer my sublease for my apartment was ending but I still had a few more shifts at work. I packed up my apartment with no where to go. I could have stayed with friends but I thought this was the perfect opportunity to see what everyone had been talking about. At least for a few days. The first mistake I made was having all the stuff from my apartment with me. At the time I did not take on the minimalist perspective that I do now. I had my coffee maker, a lamp, and mugs galore. Since it was an impromptu stay I had no strategic plan of how to organize such a small space. My work uniform was buried underneath a suitcase and laundry bin. Chaotic is the best way to describe it. Showering was not as difficult as I anticipated. I work at a gym that has showers for its members, because I work there I get a membership for free. In the morning, when I exercised, I just showered at the gym and went about my day. If I do the ‘van life’ thing for real I will just make sure I have a membership to a gym that is available in many places across the U.S.. The weather was another difficulty during the day. I couldn’t keep my car running for hours but the heat was unbearable when all the doors were shut. I needed to find a place where I could open all of the doors. So next time I live in my van it probably won’t be in an urban area. Food was not horrible for only three days, but I had no portable stove or coffee maker. Basically I was living off of peanut butter sandwiches and instant coffee. I would defiantly build a place for a stove next time. Washing my face and hands, and having drinking water was a problem. I had no water in my van. If I got thirsty I went to Chick-Fl-A and asked for a cup of water. It was twenty cents, and I had several gift cards, but still I recommend a better way of storing water. When I went to bed at night I had no where to wash my face or brush my teeth. Sleeping in the van was not ideal. For one main reason; safety. I had no curtains and anyone who walked next to my van could easily look right in and see there is a person sleeping there. I woke up in the middle of the night panicked that someone was trying to break in. They weren’t, but it had me freaked. I was not parked in a safe place in town either so that did not help my case. Overall I really just was not prepared to live in my van, but quite honestly it was one of the greatest experiences. I really had to think about everything I was doing. In my apartment I stayed up late watching Netflix and being bored, but in my van I didn’t have wifi or lights at night. It made me disconnect for a while. Ten out of ten, I would do it again. Learning from all my mistakes and experiences I may do things a little different next time. Hopefully, in the future I can remodel a sprinter van and make it my home.